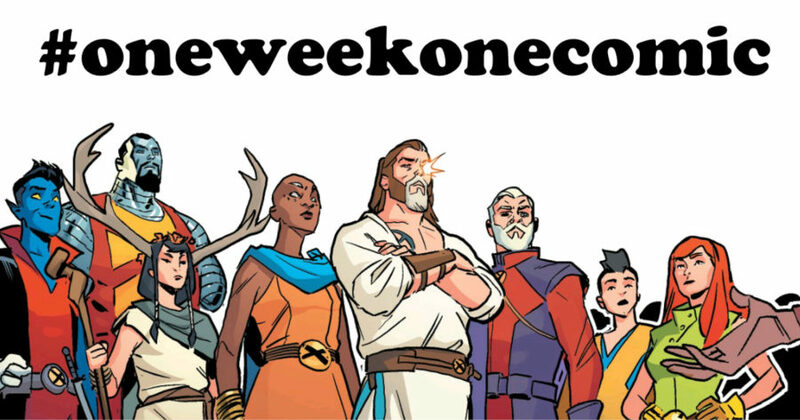 So, a quick bit of setup in case you’re as behind on X-continuity as I am: this is part of an event where Nate ‘X-Man’ Gray has created an alternate reality, an apparent utopia where everyone is a mutant. But – get this, folks – everything might not be as it seems. 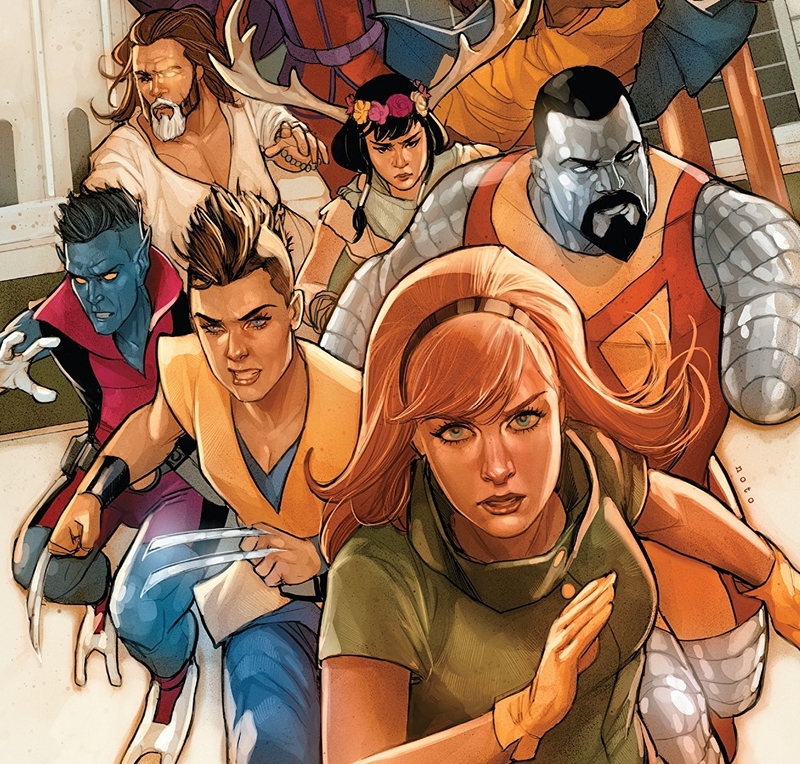 And so, in the grand tradition of Age of Apocalypse, all the X-Men get new looks, as perfectly late-2010s as the AoA versions were mid-1990s. 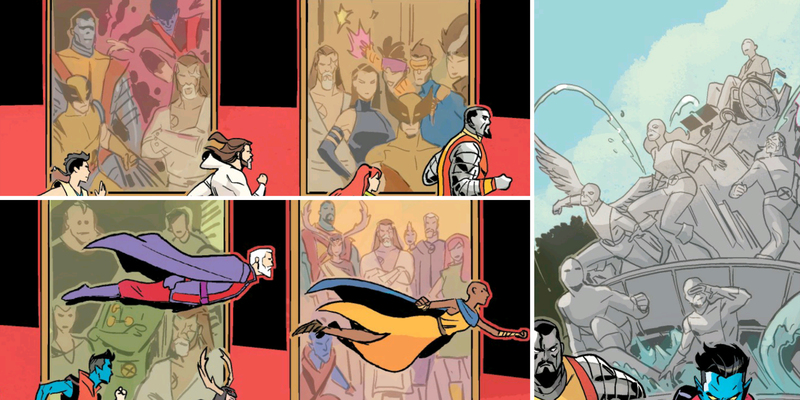 I’m talkin’ undercuts, I’m talkin’ facial hair, and most of all I am talkin’ Dream Daddy Magneto. 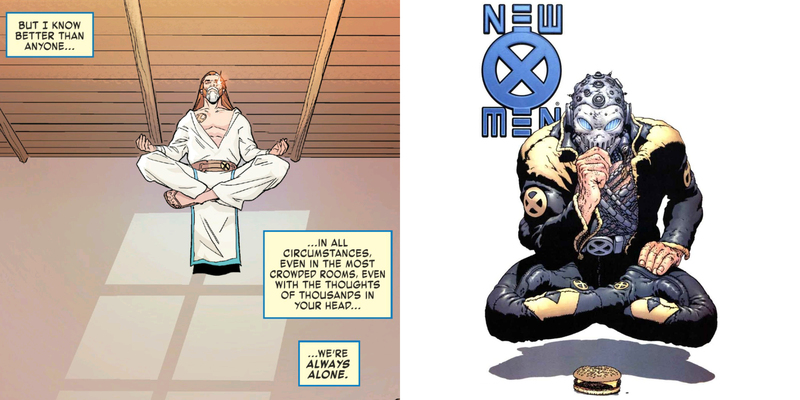 At the centre of it all you’ve got the Beardy Mutant Jesus himself, Nate Grey – seen here in a pose reminiscent of Frank Quitely’s iconic image of Xorn. I’ll leave you to draw your own parallels. 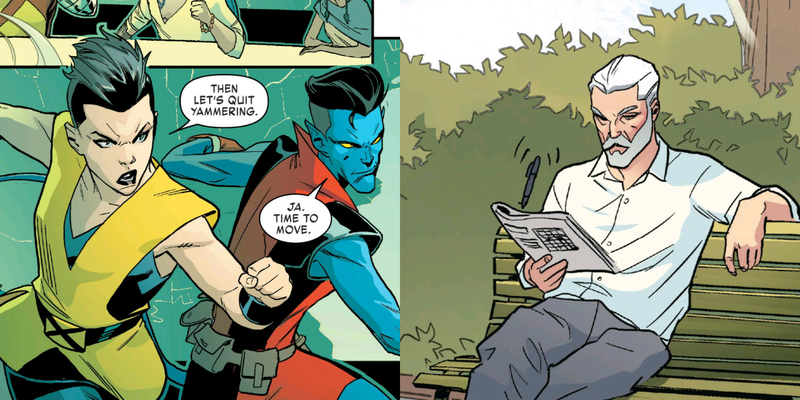 Avengers: No Surrender pulled a very similar trick, but I love the subtle glimpses of how Nate has inserted himself into X-Men history. 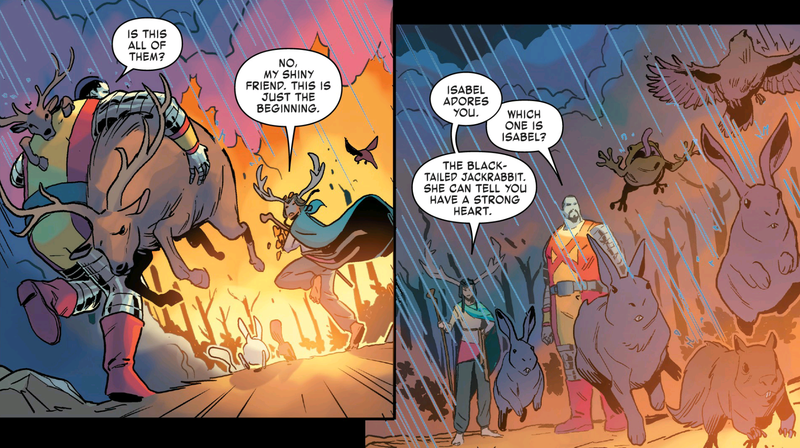 He appears to have replaced Beast in the OG Five, and was even part of Madrox’s X-Factor team in the ‘00s. 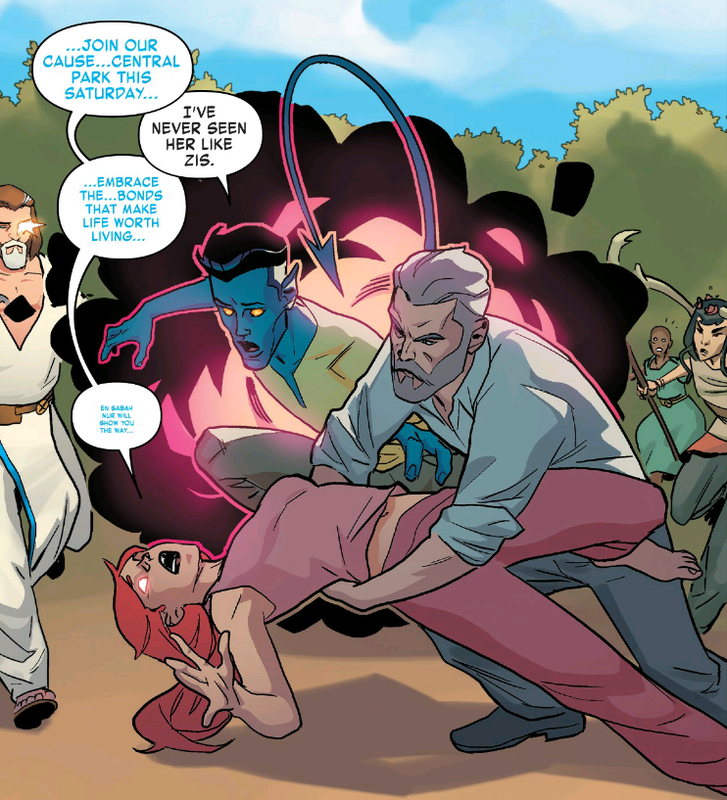 I love that it’s an issue without any traditional baddie, and the X-Men are just rescuing people – and animals – from natural disasters. 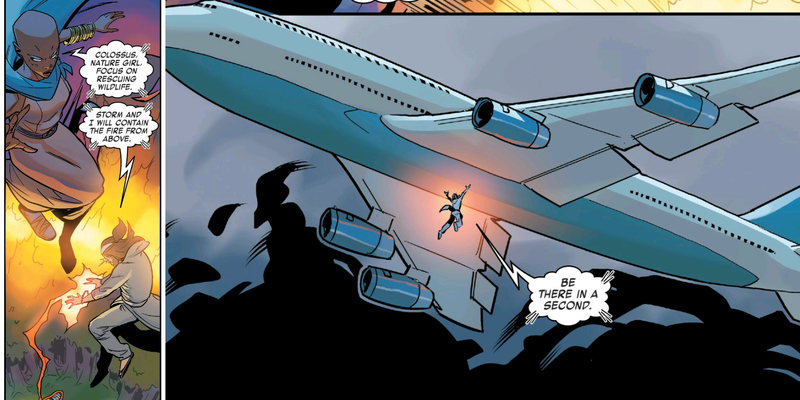 Always nice to see some superheroics that don’t involve punches to faces. The really smart bit, though, is that the big rescue takes place inside one of X-Man’s Cerebro centres, so we get a chance to see the inner workings of this society. It’s not treated as a big reveal, just background detail, because our heroes already know all about this stuff. 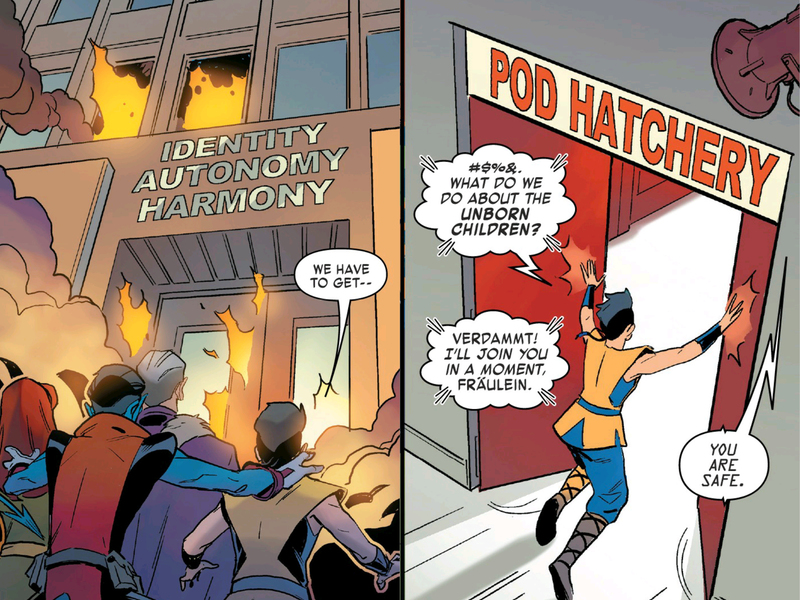 The lettering in these panels is genuinely, I think intentionally, overwhelming. All the different balloon and font styles, but also squeezing three discrete speakers into a single panel, many of them unattributed. It all adds to the mental load, and works to put us in the same position as Jean. Similarly, I really like the final balloon here. It’s a simple trick, but having to squint (or, in my case, zoom in) to see what it says makes you a more active participant. 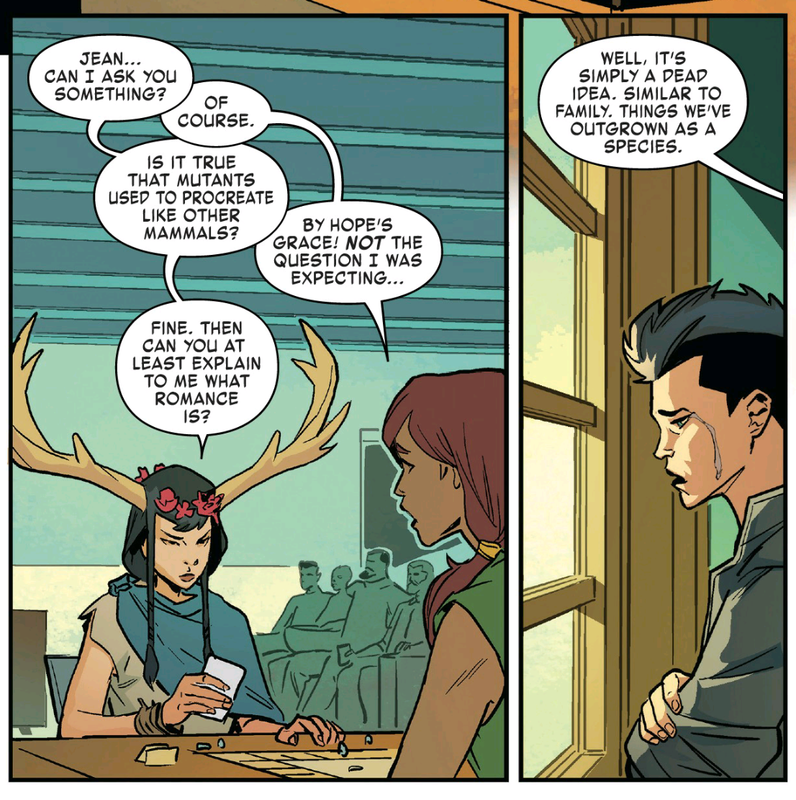 This is more or less my first experience of Nature Girl, but … based on this one issue, she seems great? 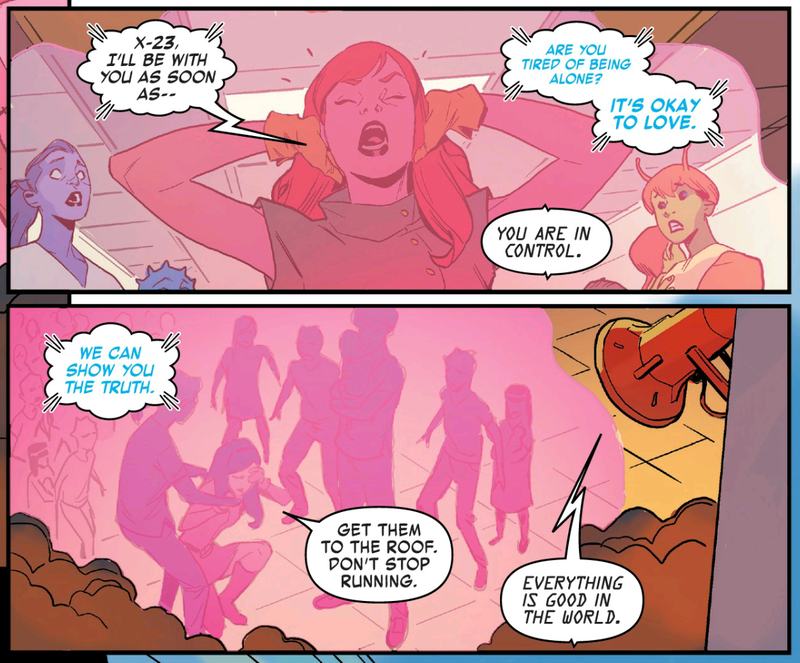 The key rule of X-Man’s world is: no relationships. The prologue one shot last week went hard on the romance angle of this, but it’s actually more affecting to see how it stops them from forming a family. 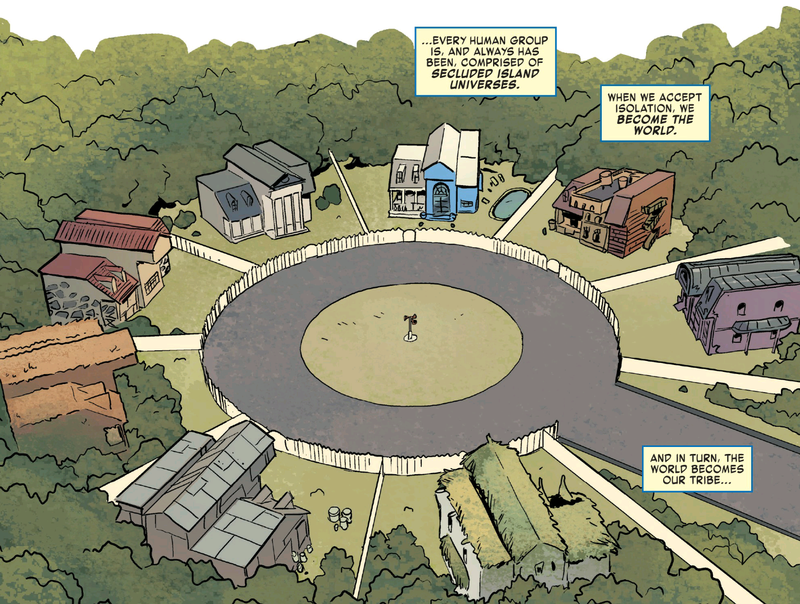 There’s something inherently wrong about seeing the X-Mansion, a centre for this community that has been the target of so many supervillains’ schemes, just… replaced, with these individual single-person homes. 2. 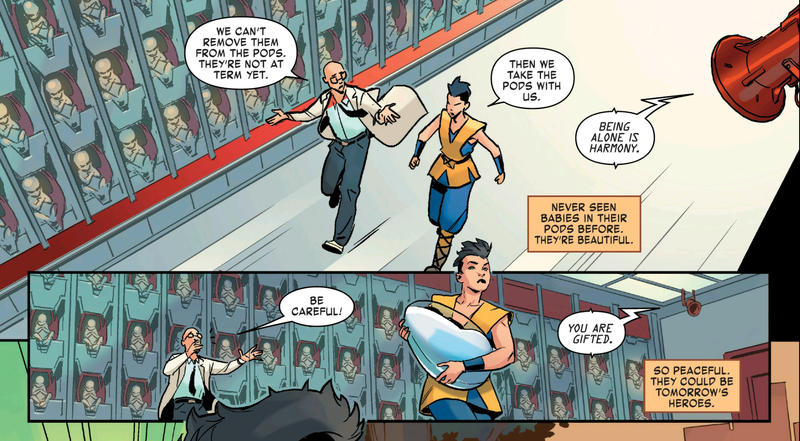 X-Man also sez: No more sexual reproduction! Which ties into the part of the mutant concept that’s about evolution, and sets up a nice contrast with, say, the natural selection obsession of Apocalypse (who is playing the freedom fighter role here). …Which is really interesting, but it all pales in comparison to this issue’s single biggest asset. 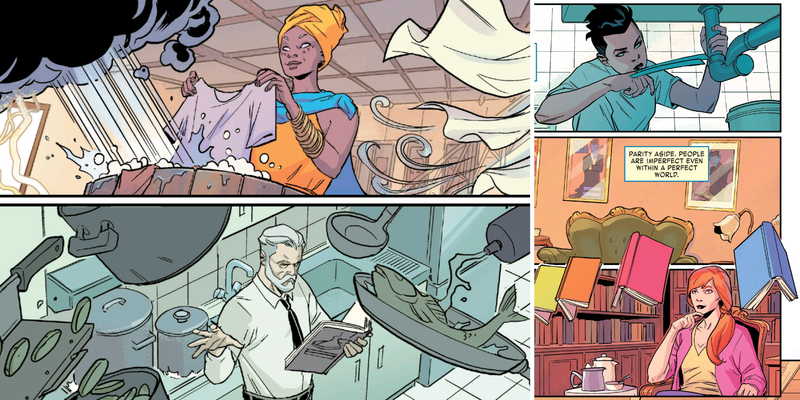 My new favourite X-Men character. Everyone, meet Fungus the bear.